With 40 million Americans over the age of 65 and a projected 11 million seniors in California by 2030, its clear that more can be done to support this growing population. Because its been found that 2 in 5 San Diego seniors have to choose between rent and food, Interfaith and Dreams for Change, with the support of the Rancho Santa Fe Foundation, launched the North County Senior Connections program nearly 3 years ago to provide North San Diego County seniors with affordable meals, as well as the opportunity to socialize with their neighbors. 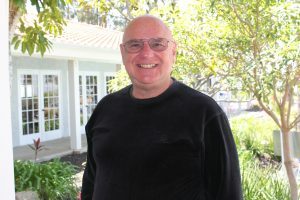 One such senior is Lee, a native to North County who has seen an immeasurable benefit to having the program in his community. For years, Lee was a Deputy Sheriff in San Marcos before launching his own computer forensics business which specialized in content recovery, data preservation and more. After fourteen years growing his business and over forty years in the San Marcos area, Lee retired and moved into the Palomar West Mobile Home Park nearly eight years ago. When Interfaith launched the at Palomar West Mobile Home Park a year ago, Lee jumped at the chance to attend. He says that all the new and interesting people he’s met has been the best part of attending every Thursday, however “you can’t beat a $2 lunch, too!” said Lee. The North County Senior Connections lunches have given Lee much more than weekly affordable meals, socialization, and educational opportunities, though – they have also renewed his passion for giving back to his community. For starters, Lee plans on putting his professional skills to use by becoming a lunch presenter himself, teaching seniors in attendance about the latest in technology, computers and the iCloud. He also is interested in purchasing a golf cart that will allow him to deliver North County Senior Connections lunches to seniors in the community who may not be mobile enough to leave their homes. If you would like to support the North County Senior Connections program and seniors like Lee, please contact Chief Development Officer, Robert Adams, at radams@interfaithservices.org or by calling (760) 489-6380 ext. 206. Tuesdays: 12:00 p.m. – 2:00 p.m.
Wednesdays: 12:00 p.m. – 2:00 p.m.
Thursdays: 12:00 p.m. – 1:30 p.m.
Fridays: 11:30 p.m. – 1:30 p.m. If you have any questions about the program, please contact Dave Lyons, Program Coordinator, by clicking here or by calling (760) 271-9264.